Entries will be generated at the Center Stage Bingo Information Desk at guest’s request. Entries may be filled out between 6:00PM and 11:45PM day of drawing. All Center Stage Bingo guests receive one (1) free entry into the drawing barrel. Promotion is open to individuals, age 19 or older, with a valid government photo ID and registration card submission. Winners will have three (3) minutes to claim their prize at the information desk. Must be present to win. Prizes are non-transferable and non-negotiable. One (1) prize per winner per drawing date. 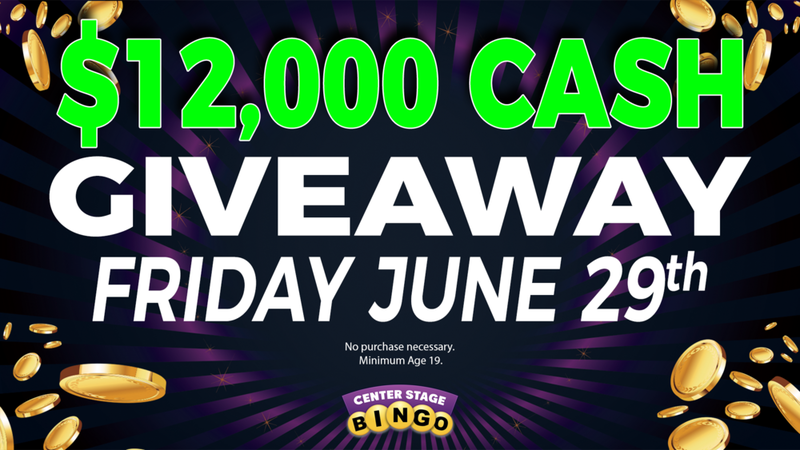 By signing a Photo Release form, winners agree to allow Center Stage Bingo to use their image and first name for any promotional purposes. All times referred to throughout these rules are Central Time and are approximate. Center Stage Bingo is not responsible for any incorrect or inaccurate information on any advertising material for this promotion, including, handbills, fliers, posters, signs, billboards, newspaper or spoken advertisements. Center Stage Bingo employees are ineligible to participate. The management of Center Stage Bingo reserves all rights to change, cancel or modify this promotion without notice for any reason. All guests have the right to contact the Center Stage Bingo management in the event of a dispute.